Now, lawmakers in a growing number of states are exploring how vastly safer tobacco products can help their smoking constituents lead longer and healthier lives. In 2012, I was invited to participate in legislative committee meetings or hearings in Kansas (April), Indiana (September) and Oklahoma (October). 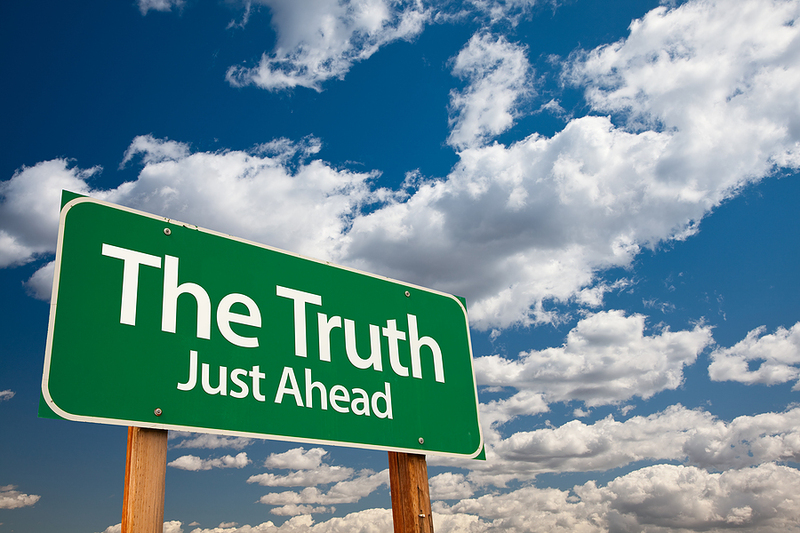 This year, legislators in Iowa, North Dakota (February), Kansas and Idaho (March) have heard the truth about tobacco harm reduction. While I was in Bismarck, North Dakota, I was interviewed by Dale Wetzel, former Associated Press writer, on his radio show, “The Legislature Today.” Dale asked challenging questions that generated a lively discussion. The interview is available here. In my lectures on tobacco harm reduction I compare the properties of nicotine with those of caffeine (see slides at left). 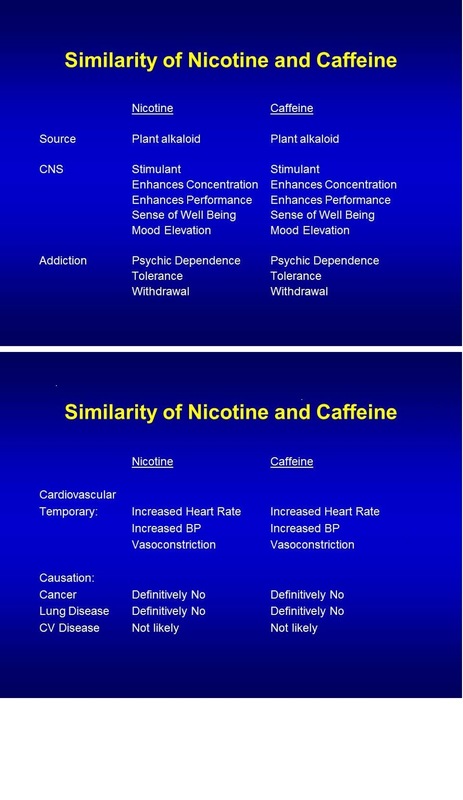 Despite some obvious differences, the drugs have remarkably similar effects. I have just found a study from 2006 showing that “…nicotine administration during moderate-intensity exercise delays fatigue, with a significant improvement of 17% [±7%] in time to exhaustion. This observation is similar to observations of the effects of caffeine supplementation.” (Available at the journal Experimental Physiology here). Authors Toby Műndel and David A. Jones of the Human Performance Laboratory, School of Sport and Exercise Sciences, The University of Birmingham (United Kingdom), recruited 12 healthy non-smoking men and asked them to cycle in a laboratory setting at a moderate pace until exhausted on two occasions. Subjects randomly applied either a 7 milligram nicotine patch or a placebo patch the evening before. been suggested to be associated with improved endurance exercise performance.” In other words, nicotine’s endurance boost stemmed from its effect on the brain. Since using nicotine is a “social” choice and the substance is metabolized at very different rates, one can only hope that WADA applies such a reasoned, practical analysis to it as well. 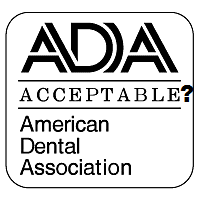 I have been critical of the American Dental Association’s distribution of misinformation about smokeless tobacco and tobacco harm reduction (discussed here and here). New ADA brochures on mouth cancer and smokeless tobacco show significant improvement over their past publications. • “Current research shows that some types of human papillomavirus (HPV) can cause throat cancer, which affects the base of the tongue and tonsils. HPV is very common— many people have the virus in their bodies and don’t even know it. The brochure mentions one other risk factor, “a diet with too few fruits and vegetables,” but this is relevant mainly for people in developing countries, not in the U.S. The new brochure on smokeless tobacco (here) drops many of the unscientific allegations that appeared in earlier versions and focuses a good deal on cessation. Mouth cancer goes unmentioned, which is appropriate, given that the risk is so low. 1. “One can of smokeless tobacco has as much nicotine as 60 cigarettes or three packs.” This is about as meaningless as claiming that one bottle of bourbon has as much alcohol as 19 cans of beer. Just as responsible drinkers modulate their alcohol intake when using different products, smokeless users and smokers modulate their nicotine intake based on the products they use, attaining nearly the same peak nicotine blood level regardless of the source. In comparing product nicotine levels, the ADA demonizes nicotine, which, while addictive, is not a major factor in any smoking-related illness. 2. “Smokeless tobacco … has over 3,000 chemicals, including 28 cancer-causing substances.” This is technically accurate but meaningless. One could also make the factual statement: “Coffee has over 1,000 chemicals, including 21 cancer-causing substances.” (here) Any food or drink is composed of thousands of chemicals, some of which are or may be carcinogens. Focusing on these is a scare tactic, described by renowned biochemist Bruce Ames as “hysteria over tiny traces of chemicals that may or may not cause cancer.” (here). 3. 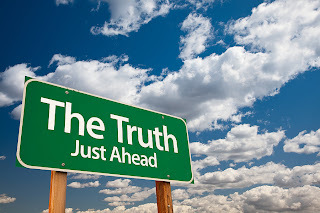 “People may think that smokeless means harmless, but nothing could be further from the truth.” No credible tobacco harm reduction scientist or advocate claims that any tobacco product is absolutely safe; suggesting otherwise is nothing but a straw-man argument. The truth about smokeless is readily apparent: A wealth of scientific data show that smokeless means almost no measurable health risk. I encourage you to read the 9-page report, which is available here. I’ll highlight some important points, many of which I have made previously (PubMed Links to the original ASH references are provided where possible). I should add that the investigators in ASH reference 12 also found that propylene glycol vapor killed bacteria and viruses that were suspended in the air of enclosed spaces (here and here), another potentially positive aspect of this agent. “Although e-cigarettes do not produce smoke, users exhale a smoke-like vapour which consists largely of water. Any health risks of secondhand exposure to propylene glycol vapour are likely to be limited to irritation of the throat. One study exposed animals to propylene glycol for 12 to 18 months at doses 50 to 700 times the level the animal could absorb through inhalation. Compared to animals living in normal room atmosphere, no localised or generalised irritation was found and kidney, liver, spleen and bone marrow were all found to be normal (reference 12). In other words, ASH does not buy into indoor e-cigarette bans because these products don’t expose bystanders to toxic agents, and e-cigarette vapor is instantly distinguished from the smoke of combusted cigarettes. While ASH has over many years aggressively opposed the tobacco industry, it notes on its website that it “works to eliminate the harm caused by tobacco. We do not attack smokers or condemn smoking.” In this case, ASH has honored this sentiment, objectively evaluating e-cigarettes and establishing a credible position.